"Sure I'm weak. I can't even use magic, but I do have one special talent." 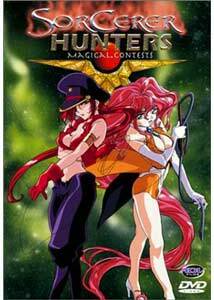 The third of four DVDs in the Sorcerer Hunters (Bakuretsu Hunter) series continues to showcase our team of players looking to rid the Spooner Continent of the evils of Forbidden Magic. This installment contains six episodes, which follow in the same general theme as the previous two discs, as the crew takes instructions from Big Momma (Sumi Shimamoto) and Dotta (Sakiko Tamagawa) and sets out after the bad guys. There are some new players in the game this outing, as Big Momma's nemesis Zaha Torte (Banjou Ginga) gets a better introduction as the powerful arch enemy we have been seeing only glimpses of to date. This also is part of the underlying story arc that has so far taken a back seat to episode after episode of seeking out and destroying the opponent of the day. As the disc opens, Big Momma doesn't have a task for our Sorcerer Hunters, so they get to take a break from work. She has been keeping secrets from Carrot and the gang about their past, which is something she knows she will have to reckon with soon, especially since Zaha Torte is making his presence known on a more frequent basis as he builds his evil powers: surely a confrontation can't be far off. As usual, Carrot finds himself getting into trouble while trying to impress the local girls, and thwarting Big Momma's plans at the same time in We Meet Again. Part of the fun in this series is the preview spiels, which this time poke at the writers for dropping in another episode that doesn't advance the story. Carrot is in heaven when the team arrive at The Hospital Of Love. Not only is there the luscious Nurse Ohno to divert his attention, but also the seemingly accommodating Dr. S'Okay to chase after. Of course Tira and Chocolate take offense to the competition, and even Carrot may rethink his motivations when he finds out how the doctor really operates. Next, it's Mother's Day, but is the gang ready for the presents—or rather presence—awaiting Big Momma? In The Hidden Gods, when a Magical Engineer, one of the originators of forbidden magic, is unleashed, the Sorcerer Hunters face their deadliest foe yet, and once again Zaha plays a part in the festivities. Beauty is in the eye of the beholder, but are our band of well-doers painted into a corner when they are the subjects of the Illusionary Darling? Finally, we meet a magician with a hankering for the healthy in The Body Worshippers. You can bet everyone gets a good work out in this one! We still don't have a complete picture of where this all is leading, other than a showdown between Zaha Torte and Big Momma, and there are still questions as to what is at the heart of everything, but a couple of bombshells do get dropped here that will have you hoping the next disc is handy. The serious elements are balanced by a lot of silly fun, and the episodic nature doesn't require sitting through the entire series to follow the action. With six episodes left before the close, Sorcerer Hunters has been an entertaining show so far, perhaps not my favorite series, but well worth the time invested nonetheless. Image Transfer Review: Image quality is consistent with the previous discs, with good color rendition, solid black levels and only a few trouble areas as far as graininess goes. Typical interlacing defects in places, though overall another good looking presentation. Audio Transfer Review: Audio is well presented, with no signs of hiss or distortion present. There is some static crackling during a few segments, though this seems limited to the Japanese track. Aside from that, everything sounds nicely balanced. Extras Review: The second half of Sorcerer Hunters was released on VHS as Spell Wars, and a trailer for that is included here. Previews for Those Who Hunt Elves, The Original Dirty Pair, Blue Seed, Gasaraki, A.D. Police and Arc The Lad are available in the trailers' submenu. Character bios repeat those on disc one of Tira, Chocolate, Big Momma and Dotta, with the addition of a couple more bad guys from this disc. Stay away until you've seen the episodes. While a few of these episodes move things along, The Hospital Of Love stands out for its complete lack of plot movement, but some hilarious insights into our collection of warriors. Plenty of laughs, lots of action, and the hintings of a story to tie things together leave us waiting for the final installment in the series. They don't call it "Baka" retsu for nothing.